People make resolutions every year; get to the gym, eat better, empty those boxes from the move, how many years ago? I find that every year I tell myself I am going to focus on my blog, on posting my ideas and experiences. Each year time gets away from me. Reading my last post I have to laugh; I can say I have spent the last year re-designing my life. My youngest daughters went off to college, I met my weight loss goal ( finally) and I have reconnected to many past friends and clients. Recently I had the great pleasure of working with a lovely couple on a master bathroom renovation. They came to me through a wonderful friend, my contractor, Ali Rad. They had two needs; one was that they needed to reconstruct their master bathroom due to problems they were having with leaks, etc. That is never a fun way to have to renovate... The other is that they needed to feel that they could make this room their own, to feel like a master bathroom - elegant, sophisticated and special. They had a specific look in mind, and it was my charge to help them realize this dream. The challenge was not being able to make this dream come true... it was finding the time in their busy schedules to make selections and decisions so that the job could be completed by their deadline; and of course in the time that the contractor allowed. As always I started with talking to them, and getting a clear understanding of what they wanted, what they like, and more importantly, what they do not like. The ideas merged; "an elegant, updated, sophisticated master bath that would be kid friendly for now, but serve as a private sanctuary in later years." As a designer, you need to help interpret ideas; bringing each persons thoughts to the table and creating one final picture that will please everyone. The existing master bathroom footprint is large, which gave us some options. The homeowners needed to stay within a budget, so we were sensitive to this. 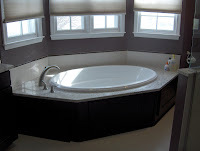 Re-using the large oval master tub allowed for a centerpiece in the room that was beautiful and gave them leeway to spend the budget in other areas. We visited the stone yard and chose a beautifully rich, yet clean granite; with greys and deep burgundy highlights. We decided to use the same granite on the counter and the surface of the tub. 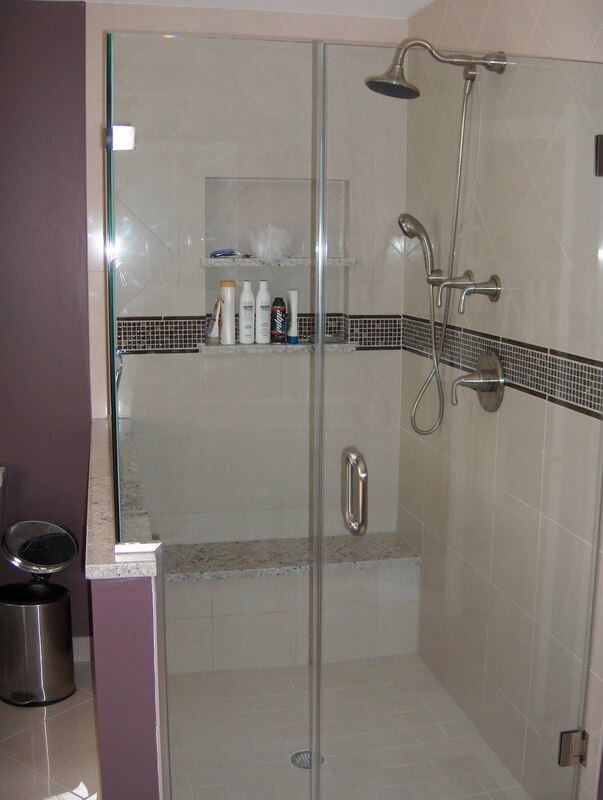 A mix of glass and stone mosaic also had rich colors of grey and a deep plum like burgundy that would pull this color story together. 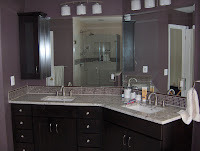 We designed dark wood panels as the tub base to match the new cabinets. This anchored the room and created a focal point. Ali was able to swap the location of the commode with the shower to allow for a GRAND shower, with a seat. The entire room was coming together. 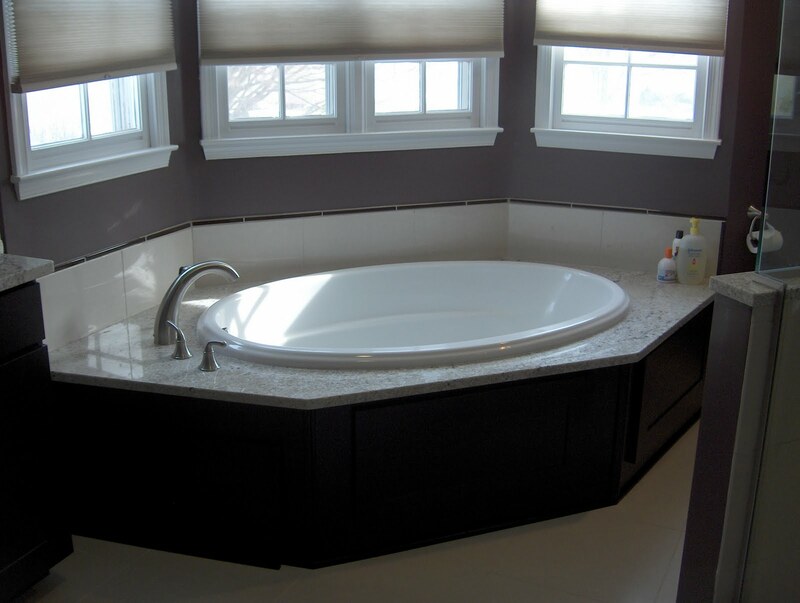 We chose a very neutral floor with deep dark cabinets highlighting the space with white rectangular sinks to match the existing white tub and commode. The rectangle sinks were the final touch for the feel they were looking for; a "Restoration Hardware, upscale, trendy space". Now the fun begins... faucets, cabinet hardware and wall color! The deep jewel tone in plum brought out the rich burgundy in the granite, along with the glass mosaic featured in the shower and the sink back splash. Glass handles with brushed nickel hardware to match the faucets, a simple beveled edge mirror that illuminates the entire room, and lighting fixtures that accent the lines found in the oval tub, rectangular sinks and interesting room angles help create the final touch. Take a look at the after images, what a change! I am happy to say that the homeowners are thrilled with the new look and I could not be happier! We continue to shop for the special details; photos and art for the walls, and the proper towels in a color that will blend perfectly and other decorative items that will finish the room. Take the time to think about what you want your room to "feel" like. You can accomplish with a simple coat of paint, or just adding new art and towels to your bathroom to magically transform it into a space that you dream of! 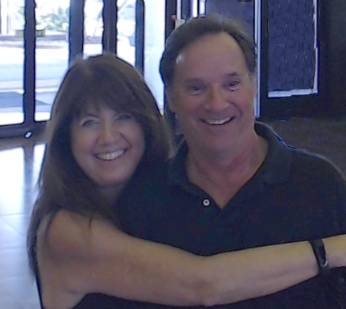 Working hand in hand with an experienced contractor and my client we were able to realize the dream!